With only two months to go until we open the doors for our sixth Yarndale festival, we are getting all giddy about the fun yarny things that give the team (and visitors) a real creative buzz. Big, colourful mandalas are being hooked up, socks are being knitted, new yarn bombing pieces are under construction and our world famous Creative Community project is about to be unveiled. As the title of this post says, this year we have chosen butterflies as our theme, and we are more than a little bit crazy-excited about the visual and creative possibilities that a whole swarm of yarny butterflies will deliver. Actually, we just discovered that the collective noun for butterflies is a kaleidoscope which has made our idea seem even more lovely. 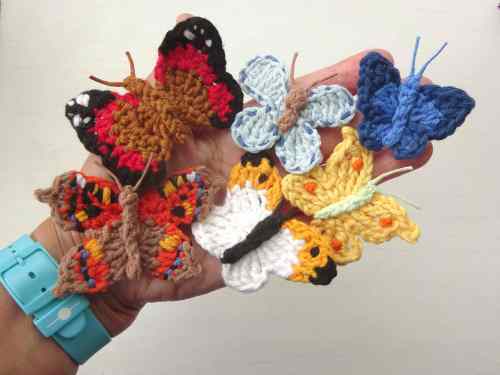 Butterflies are small little things, so are quick to make and prefect for using up scraps of colourful yarn. Plus for the benefit of all our generous overseas contributors, we are hoping that they will be easy to pop in an envelope to send to us here in the UK. This year we would love to receive as many butterflies as you wish to send us, whether that’s just one single, beautiful specimen or a whole rabble of them. 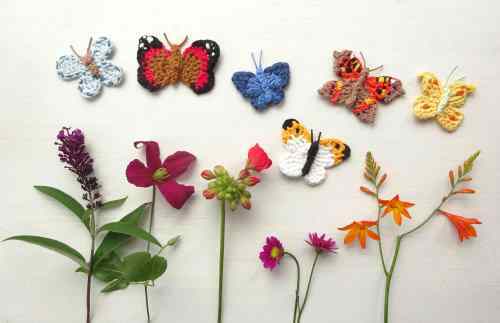 From experience, we can tell you that it’s near on impossible to crochet just one – butterflies are super-addictive to make, so we hope you really enjoy the creative process. In the information section below we’ve listed a round-up of free crochet patterns which you can find online – we hope to inspire you to join our Creative Community this year and become one of our fabulous contributors. Q :: How many butterflies would you like me to make? A :: as many as you like – just one, or a whole kaleidoscope! Our idea is to take one butterfly from each contributor for use in our creative display. All additional butterflies will be available to fly away with our Yarndale visitors in exchange for a generous donation to our chosen charity. A :: Any yarn you like! We’ve found that cotton yarn gives great results for this project, but any oddments of 4ply or DK yarn will be fine. We’d prefer the butterflies to be of a size that could easily be pinned as a brooch, so no huge chunky creatures if possible! 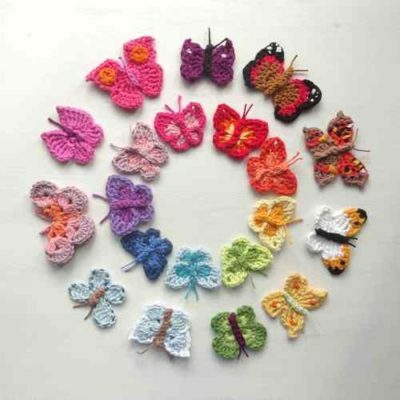 Q :: Where can I find patterns for the crochet butterflies? A :: Any butterfly pattern can be used so long as the finished butterfly could be pinned as a brooch. 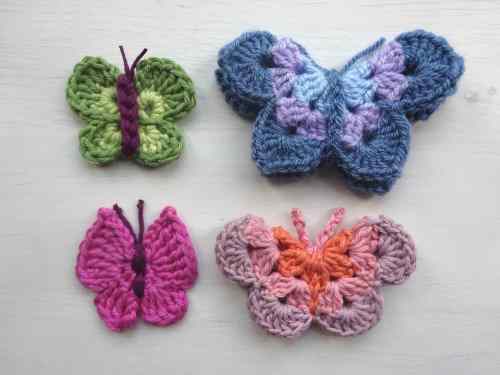 To help you we have rounded up some fabulous FREE crochet butterfly patterns…. We can also highly recommend these books by Lesley Stanfield if you have access to them, they contain some stunning knitted and crochet butterfly patterns. Not forgetting our knitters, we are also happy to receive knitted butterflies – any pattern can be used so long as the butterflies aren’t ginormous. A :: Details of all materials needed are contained within the patterns, but use whatever hook suits the yarn you are using. Ideally we would prefer double knit or 4ply for the butterflies to keep their wings nice and neat. Q :: What size should my finished butterfly measure? A :: Please aim for butterfly size!! Anything up to 10cm wing span will be great. Q :: What colours should I use, and can I add decorative touches to my butterflies? A :: Please use whichever colours float your boat and please be creative! We are happy for you to embellish, button, bejewel, stitch and personalise your butterfly in whatever way you wish. Q :: Do the butterflies need blocking/stiffening? A :: No, this isn’t necessary. Q :: Where shall I send my butterflies? Q :: What information should I include with my butterflies? A :: Please could you supply your name, along with your town/county/state/province and country. Q :: Will this project support a charity? A :: Yes it will. The butterflies will be displayed during the Yarndale weekend, with the aim of raising awareness and monies for Pioneer Projects. This is a local Yorkshire charity which uses the creative arts to support those living with dementia. Our aim is to create a stunning visual display using one butterfly from each contributor. Any additional butterflies will be available to Yarndale visitors in return for a generous donation to Pioneer Projects who are a small charity doing great things. Our support means the world to them and we are thrilled to be helping with their vital fundraising. Q :: What will happen to the butterflies after Yarndale ? After Yarndale, some of the butterflies will go to Pioneer Projects to form a permanent display at their centre, as a reminder of the great things that our yarn community can achieve. We hope you will be happy for your butterflies to fly off after Yarndale to continue their journey spreading love and comfort. THANK YOU SO MUCH FOR JOINING IN WITH OUR BUTTERFLY PROJECT! Can I knit butterflies as I don’t crochet. Awesome idea. Wish that all hospitals could give “comfort” bags at this emotional time. I hope that your kaleidoscope of Butterflies surpasses all expectations. Good luck to you all. Beautiful! I work for the Turner Syndrome Foundation if the United States and our logo is a butterfly. Women and girls with Turner syndrome refer to themselves as “butterflies” and our community is very closely related to butterflies. This idea would be great for our national conference.